You seem to be under the mistaken impression that “workplace wellness” programs are actually about the health and well being of employees. They’re not. Plain and simple. They have absolutely nothing to do with increasing employees’ real or perceived health or well being. They are all about reducing (or at least quantifying) INSURANCE COMPANIES’ financial risk. If a “wellness” program could require something that was actually BAD for an employee’s overall health or well being but that reduced the INSURANCE COMPANY’s financial uncertainty — you can be sure they will “incent” that eventually. It may be couched in “its for your own good” verbage, but its not. Its really for the insurance company’s bottom line. Hi rg, I understand your frustration with conventional workplace “wellness” programs. I have no illusion about the financial motives of the stakeholders here. And I would even go one step further and say that many worksite programs already DO promote activities that are likely to be “bad” for employees’ health – to wit, any program that encourages weight cycling (e.g., biggest loser contests and the like). However, most workplace wellness program decisions are made by employers, not by insurance companies. Insurance companies may recommend or promote certain programs etc. but in general, employers ultimately decide what programs are implemented. And, perhaps revealing my essential optimism, I do think that it is possible to show employers that these discriminatory programs and these programs that bribe and penalize employees cause more harm than good, both in terms of the bottom line and also in terms of less tangible but also important factors such as recruitment, retention, absenteeism, and employee morale. I think these programs are going to backfire on employers eventually; I am simply saying we need to marshal the evidence and offer alternatives sooner rather than later, before ever more employees are harmed by these practices. I also believe that we can make an argument that what is good for the employees IS good for the employer. Will every employer listen? No, of course not, but some will, and when those programs succeed in containing costs and helping the bottom line, we need to document that and convince more employers that it’s actually in their interest to promote health. We have to start somewhere. I agree that employers make decisions about workplace wellness programs. However, these decisions are made by the contract negotiators who negotiate the contracts with the health insurance or HMO provider(s) that provide health insurance benefits for employees. The employer will seek bids or proposals from health insurance providers. In response, health insurance providers send a proposal that says they will provide such-and-such set of benefits at such and such price, or at such-and-such [lower] price IF the employer institutes XYZ “workplace wellness” program(s) (sometimes there may be choices about wellness programs that are negotiated as part of the health insurance contract deal). Once the employee health insurance contract is signed, the “workplace wellness” programs required for compliance with the health insurance provider contract have already been determined. I know this for a fact. I work in enterprise procurement for a large state university system. I am alternately amused and horrified by so-called workplace wellness programs. My husband is a nurse and his employer does absolutely zilch to improve their employees’ health. No breaks (yes, I know they are mandated by law; tell that to the nurses who don’t even have time to go to the toilet), crazy schedules, not knowing until two hours beforehand if you’re going to work, etc, etc, etc. Because this is a female-dominated profession, there is little respect for nurses and the stress they are under. In easy ways, the employer could lessen the stress and make work more humane, but that would take an enormous change in mentality. Meanwhile, it may be that employers in the health care industry are among the worst offenders, if even half of what we hear is true. A colleague recently put together a wellness program for physicians, who had been identified at that workplace as extremely stressed and unhealthy (which is consistent with the data for physicians nationwide). The physicians had actually asked for the program, which was promising — except that apparently management kept scheduling mandatory meetings for physicians during the meeting times of the program, so few physicians were actually able to attend. History has shown that the actual wellness of its employees is usually way down on the list of corporate priorities, if it is there at all. A middle manager who shows too much empathy toward the wellness of those in his or her charge, is usually considered suspicious in the corporate pecking order. I believe the first two commenters would agree with that. I also believe that blogger Ferguson has done a fine job in discussing the things that can be done to counter the current trend. 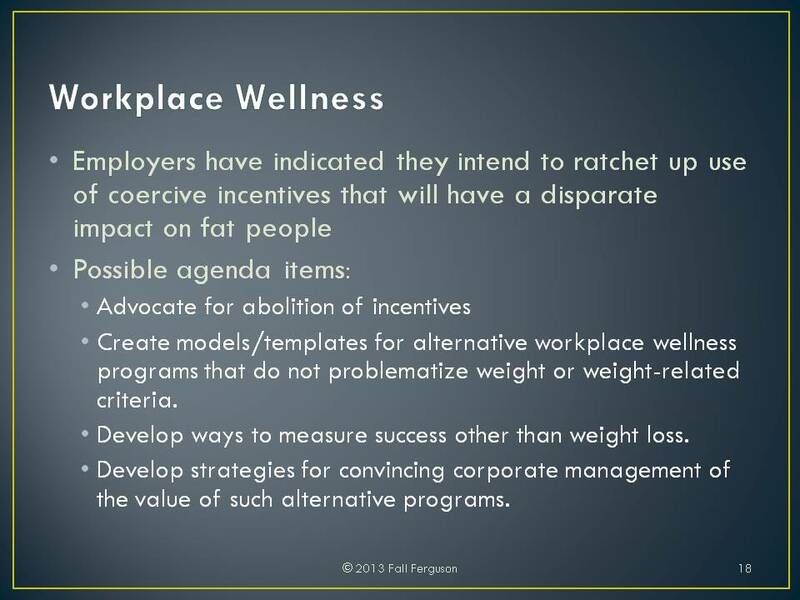 Jon Robison outlines in a very nice bullet list the overall paradigm shift that needs to happen around the culture of workplace wellness. I wish you luck and success in this endeavor. I would love to take a pre-designed program to our local HR dept and help them implement a viable wellness program. I do have some level of influence locally. On an international corporate level, HR has just rolled out a FitBit walking program, which I signed up for. I’m mixed on my feelings about this as (a) walking / moving is a good thing to promote and it is not weight-based and (b) it’s a little bit of “big brother” watching me which I’m not such a fan of. Being of a science and problem solving background, I firmly believe that “If you can’t measure it, you can’t improve it”. Defining the metrics to be measured in a fair and non discriminatory way is the tricky part, right? Measuring the wrong metrics will lead to wrong wellness activities being supported and reinforced. In my mind, a good wellness program would include education on nutrition, cafeteria meals that offer real true, not false, healthy food choices. (False option is the chicken salad with 600 calories worth of processed hydrogenated mayonnaise and extra salt, or the yogurt with artificial flavors and extra refined sugars and un-pronounceable additives). Cooking classes on how to prepare yummy vegetable dishes (to support an “eat more veggies” philosophy). Include non-food related educational programs, for example: information and actual practice on exercise and movement and proper ways to do strength training without injury. Also mental health: reducing stress, how to counteract feelings of depression, etc. I still think it is extremely naïve to believe that “workplace wellness” programs have anything to do with concern for employees’ well-being. They are negotiated deals between employers and insurance companies to “keep the cost of insurance down.” The objective is to negotiate a “deal” with the insurance company to keep employers’ and employees’ premiums lower. The insurance companies are the ones that decide whether or not they will lower the premiums for activity “X.” If you want to target “employee wellness programs” then you need to target INSURANCE COMPANIES with messages of what works or doesn’t work, and those messages need to be about reducing the insurance company’s liability exposure, not about actual well-being of people. If you want to influence employees’ well-being with things under the control of the employer, the thing to target is “employee benefits” – NOT “workplace wellness programs” which are highly negotiated package deals between employers and insurance companies. It is under “employee benefits” (NOT “wellness programs”) that there is some hope of getting yummy cooking classes, more nutritious cafeteria food, stress-reduction programs that actually reduce stress caused by the employer and don’t just teach employees “coping skills” for coping with all the stress that the employer is causing, etc.